An app to give you detailed info about any file or folder on your Mac. You can also see a list of apps compatible with your file. File Helper is an app that allows you to see detailed info about a file or folder. And how? By simply right clicking on the file/folder and choosing ‘Get File Info’ option. That’s not all, you can also see a list of apps compatible with the file you choose. This is an app that’s small in size and always handy. Simply drag & drop a file/folder of your choice whose details you wish to know. It’s that easy! View the list of apps that are compatible with your file so that it’s easy for you to view that file later. See all details of the file/folder of your choice by simply right clicking on the item and choosing ‘Get File Info’. How to get File Helper? 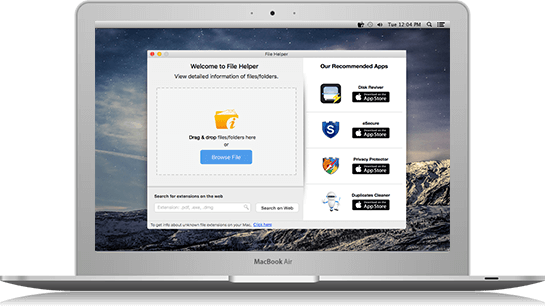 Simply get File Helper from the Mac App Store. Download it by clicking on the button below. You can then start viewing detailed info of any file/folder. Works perfectly. This app is so easy to use. I could view all detailed info about my file and also the apps that can open it. It is an app that one should be having on their Mac machines.